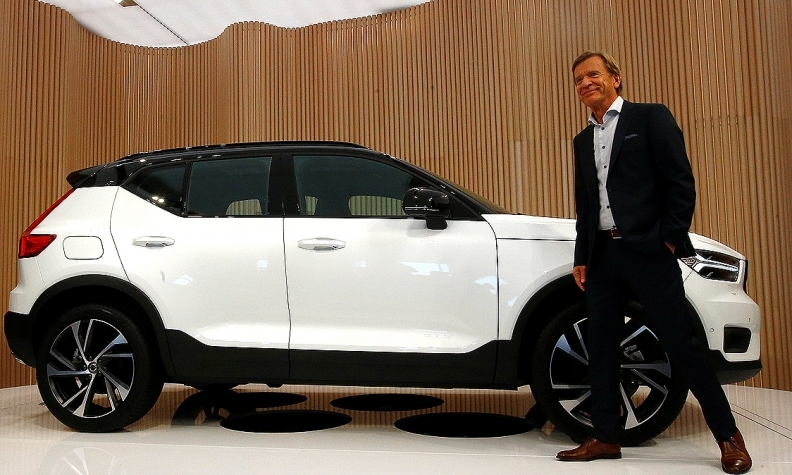 Samuelsson with the XC40 The new crossover is a crucial part of Volvo's plan to increase global sales nearly 50 percent by 2020. LOS ANGELES -- Having a strong lineup of vehicles that consumers want to buy is no longer the simple recipe for success for Volvo. CEO Hakan Samuelsson said the key to long-term success also lies in creating lucrative partnerships with tech companies. In an interview with Automotive News at AutoMobility LA, Samuelsson discussed the automaker's strategy to maintain its sales growth while preparing for the deployment of autonomous vehicles. "We, as a company, have rather low market share," Samuelsson said. "Our growth story is based on a rollout of new, much more attractive cars." And deals. In November, Volvo announced it will sell 24,000 self-driving cars to Uber, once the technology is ready. Volvo is open to working with other ride-hailing companies for similar supply agreements, he said. "Selling these cars to Uber is an interesting business case," he said. Volvo's growth story began in 2010, when Chinese company Zhejiang Geely Holdings bought the Swedish automaker from Ford Motor. It's beginning to show the products resulting from this culture change — and the $11 billion investment from Geely that came with it. As Silicon Valley companies and new startups race to deploy autonomous vehicles, automakers have been investing heavily in these technologies and acquisitions to maintain a competitive edge. To ensure lasting success, Volvo is working to balance the momentum of its product ramp while carving a foothold for the long term. Volvo has made a number of commitments to transition to a new mobility future. In July, the automaker said it would electrify all new vehicles beginning in 2019. In September, it introduced a subscription service for flexible vehicle ownership, and in November, Volvo inked its deal with Uber to co-develop and sell 24,000 XC90 SUVs for a commercial self-driving taxi service. Though the automaker is co-developing self-driving technology with Uber and working on autonomous driving capabilities for its own vehicles, Samuelsson said Volvo has no interest in its own ride-hailing service. He added that Uber's recent public relations disasters, including a widespread hack and a letter written by an employee detailing an operation within the company to conceal information, indefinitely postponing its trade secrets lawsuit with Waymo, does not pose a concern to the partnership. Despite the string of mobility-related announcements, Samuelsson said radical industry changes are years away. Volvo doesn't plan to release an autonomous driving system capable of highway driving until 2021 and doesn't expect a full transition to electric vehicles until 10 years after 2019. Volvo is also focused on its current product overhaul, with redesigns of the V90 wagon and XC60 midsize crossover and the introduction of the XC40 compact SUV in the past year. More launches are expected in the coming year, with the V60 and S60 due for redesigns, and the rollout of the rest of the new 40 series. The latest offerings have translated into sales success, with global sales up 8.6 percent year to date — though U.S. sales have declined 1.4 percent compared with the same time last year. "We still have a rollout continuing of cars," Samuelsson said. "I think we have the potential to continue growing."